What to do with your free-time in Madrid? Although we do our best to organize many activities for international students that work for everyone’s schedules, we know it’s hard to make it to all of the activities you’d like to. After all, you are here first and foremost to study, and when you do have free time there are too many amazing things to choose from. So, here are some suggested activities that you might want to do on your days off, many at discounted prices especially for the Citylife community! To win free tickets on a weekly basis to our activities & trips as well as other amazing prizes, simply participate in our weekly raffle! Play some rounds with friends at Bolera Chamartín! You should also check out our events page for our next bowling event. Happy bowling! Grab your skates and some friends and check out Madrid’s very own roller rink! Rolling Dance & Burger is a great place to spend an evening rollerblading to the music and enjoying dinner once you’ve worked up an appetite – you can either bring your own skates or rent a pair of theirs. 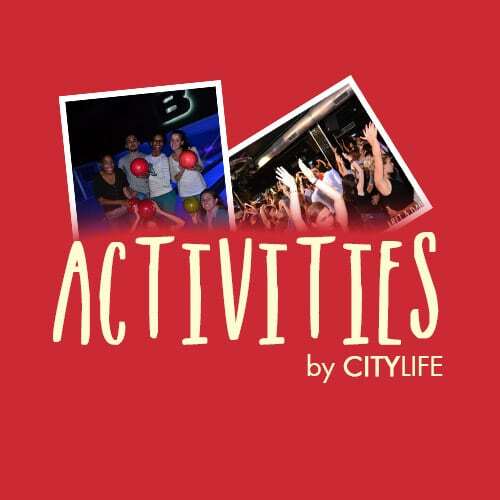 Keep up to date on Citylife’s events so you can attend our next Rollerblading excursion! Nothing says winter like ice-skating and hot chocolate. Enjoy winter in Madrid all year round at Sport Hielo – one of the largest indoor skating centres in the city! See our activities page for the date of our next ice skating trip! The Zoo & Aquarium is a large park with many animals from around the world. The park specializes in conservation and education on the many animals of the world! Go and check out the newly renovated Aquarium as well! Parque Warner is a Disney type theme park featuring rides inspired by all your favourite Warner Bros films and TV shows! Spend the day riding the rides and cooling off int he water park with others who are still kids at heart! If you’re looking for the thrill of rollercoasters without the price of a movie themes park, the Parque de Atracciones is definitely worth checking out! Never heard of this game? Fox in a Box is a timed challenge with friends to see if you can solve the clues and escape a locked room has never been more fun! Check out our event section and see when our next fox in a box adventure will be. Go-Karting: This all-American pastime is an awesome way to spend an afternoon. Race your friends, cheer on others, grab a snack, and make some memories. Visit Carlos Sainz Karting Center for a fast paced day of racing! Do something a little different and go paint balling here in Madrid and have a adrenaline filled day with your friends! 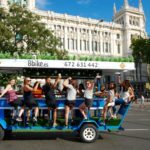 Have you ever seen or heard about BBBIKE MADRID? 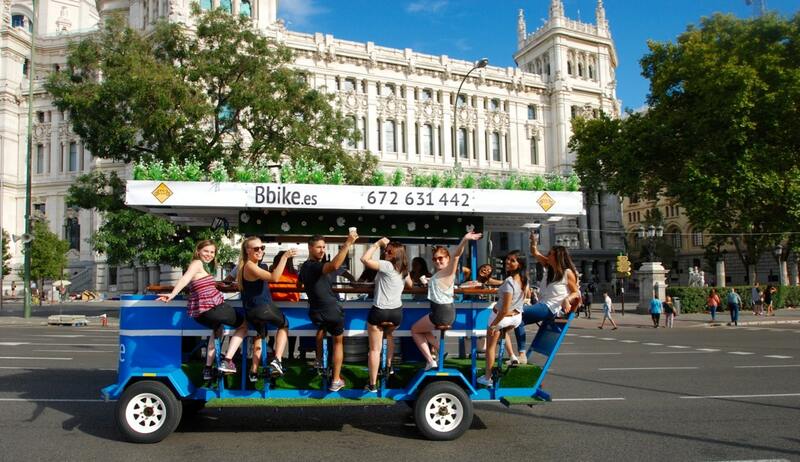 This huge bike/multi-tandem that goes by Atocha, Prado Museum, Plaza Neptuno and Plaza Cibeles with 18 people, most of them pedaling while drinking beer straight from the tap (on the bike!) and listening music? Well… dont let people tell you how it was, DO IT!! It´s such a fun activity! And the perfect place to make new friends! Visit their website for more info! They are open everyday of the week from 11am to 11pm wether the sun is shining, raining, snowing or freezing! Want more ideas on how to make the most of your time in Madrid? Check out our Live & Enjoy Madrid guide free for download! To stay up-to-date on all the latest things to do, sign up for our weekly newsletter!